I had been invited to attend the annual service of commemoration for the Battle of Arras at the Wellington Quarry and had written a blog piece about the impending service which had been picked up by the WFA for inclusion on their website. Sadly I was unable to attend due to family commitments but I have been sent images and details of the event by Isabelle Pilarowski of the Wellington Quarry. 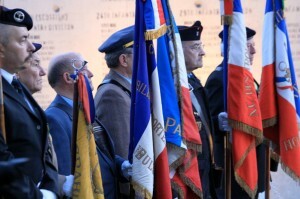 The service is held at 0630hrs on 9 April each year. The early start is due to the start of battle in 1917 – Zero Hour was 5.30am. It is a gathering of people who want to pay their respects for the men involved in the huge British offensive at Arras in April and May 1917. So often overshadowed by the Battles of the Somme and Passchendaele, Arras stands as one of the three major British offensives of the war. 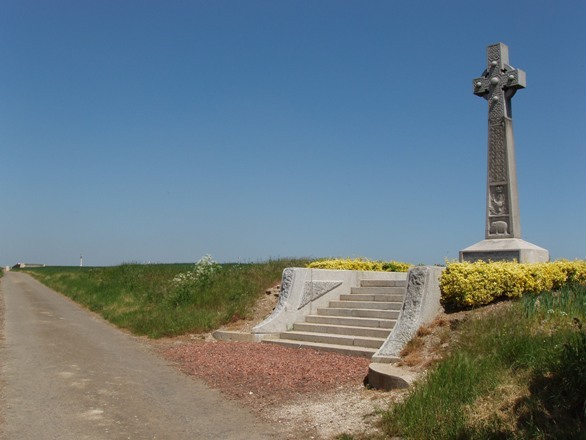 I have a huge soft spot for the place, as a battlefield and a superb town to visit, and enjoy the quiet surroundings without the hordes of coaches and resulting pilgrims that can often be seen in some of the more popular battlefield stops on the western front. Isabelle tells me that the service went very well and that it was well attended by officials and visitors alike. Attendees included the Mayor, the Préfet, the Ambassador of New Zealand, representatives from Australia and Canada [denoting their countries role in the Battle – at Bullecourt and Vimy] as well as members from other French and British associations. Now that I am back at my desk in Bristol I can reflect on a wonderful time spent in Arras from the 11-13 November with my colleague Peter Barton. The main reason for our visit was to do a talk (in French) to the locals and media. This was scheduled for 1830hrs on the 12th, ensuring we had sufficient time to meet up with Rachel Gray, great-niece of Percy Clare, 7th East Surrey Regiment. Those who have the Arras panorama volume will know his name – we used extracts from his fantastic memoirs extensively, both for the pre-battle build up and 9 April attack and the disastrous 3 May attack between the villages of Monchy-le-Preux and Pelves. Rachel lives in Aylesbury and her local paper, the Bucks Herald covered the story in a piece entitled “Following in the footsteps of a hero”. 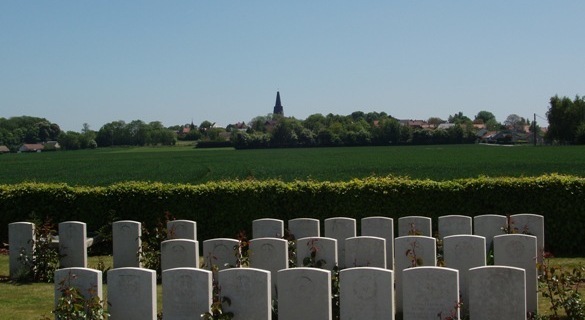 I had let Rachel know about our talk some time ago and she had agreed to travel out to Arras with her partner Brian so that we could give her a highly personalised tour of the battlefields – literally, as the newspaper article intimated, following in Percy’s footsteps. After meeting at the Hotel d’Angelterre and having a quick fifteen minutes explanation of the battle we set off along the Arras-Cambrai road to the starting position of the 7th East Surreys on the first day of battle, 9 April 1917. Such is the quality and details of Percy’s writing that we could almost stand on the exact spot where each event happened. This luxury was denied us by the British front line, No Man’s Land and first four lines of German trenches being covered by the industrial units that have grown eastwards along the Roman road. Still, this did not spoil the experience. We then drove up over Observation Ridge and I pointed out the site of Sergeant Cator’s VC action and the site near Orange Hill where the battalion spent a freezing cold night on 11/12 April 1917. Percy Clare later wrote; ‘Of all the bad nights I spent in France, this one was easily the worst’. 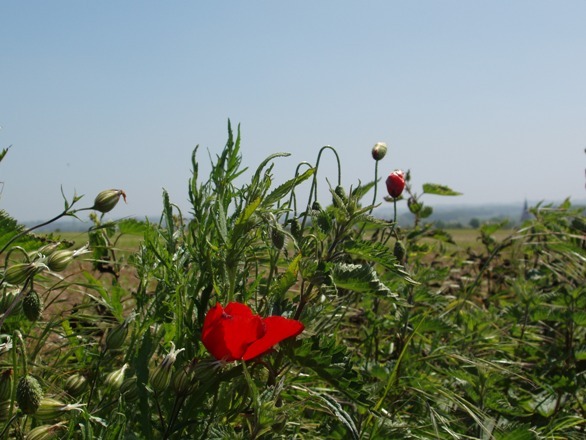 We then headed up to the fields between the villages of Monchy-le-Preux and Pelves where, by driving across the farm tracks (thank goodness for Peter’s Range Rover), we followed the disastrous attack of the battalion on 3 May 1917. 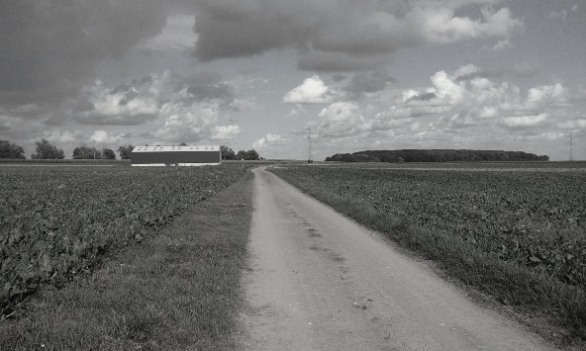 It was possible to see the ‘dead ground’ which Percy described as sheltering him and his colleagues from German machine gun fire from the direction of Keeling Copse and Bois des Aubepines. We drove up a track to Bois des Aubepines to have a view of the entire battlefield and appreciate the commanding position the Germans held. 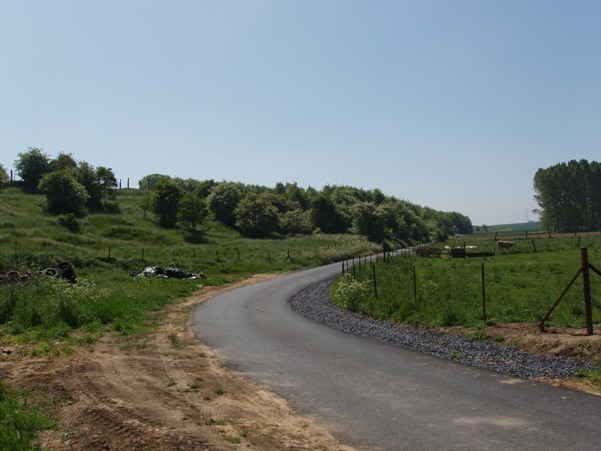 As we looked back towards the British start positions in the direction of Bayonet Trench we knew that that this benign ground in front of us was the ground in which Percy Clare and his pal, Edward Gunnett had rolled back to safety whilst under continual German machine gun and rifle fire. After spending some time here we went back into Arras and visited the Faubourg d’Amiens Cemetery and British Memorial to the Missing. The East Surrey’s panels bore names we recognised – one being Captain Thomas King, commanding ‘A’ Company whose compassion shone through when he had removed his coat, placing it over his sleeping servant in the bitter cold of the 11 April night. Captain King was then killed by a German grenade exploding on his chest in the 3 May attack. 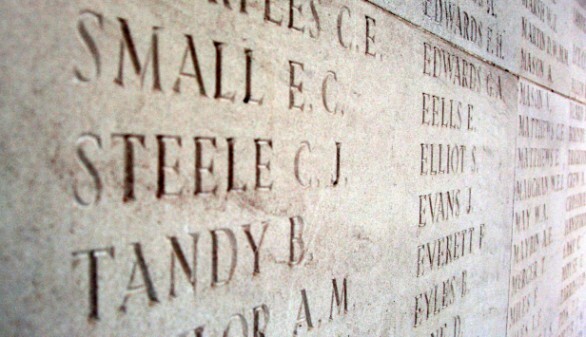 Another was Lance Corporal Christmas James Steele, a friend of Percy’s who had been killed when running into the British barrage on the German front line on 9 April and Private George Bean who Percy had discovered in No Man’s Land on 3 May, dead but with no trace of a wound on his body. We then headed back into Arras to drop Rachel and Brian off for a well-deserved lunch. Peter and I then spent a couple of hours putting up panoramas, aerials and maps on the walls in the Thompson’s Room at the Wellington Quarry – our talk venue. The talk began at 1830hrs and we were delighted with the number who came along on a wet, cold night – over 100 people meant standing room only at the back. 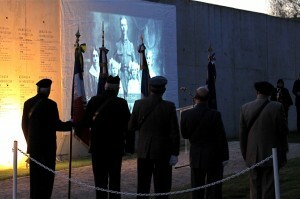 Peter’s talk was entitled ‘The Battlefields of Arras – the Past, the Present and the Future’. It started with the Battle of Arras and focussed not on specific actions but more on general tactics as well as an emphasis on the importance of the quality of the battlefield archaeological work undertaken in Artois. 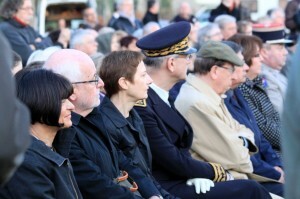 I then spoke for about ten minutes (apparently my French was understood!) about Percy Clare and his role in the battle as an illustration of one man’s battle. 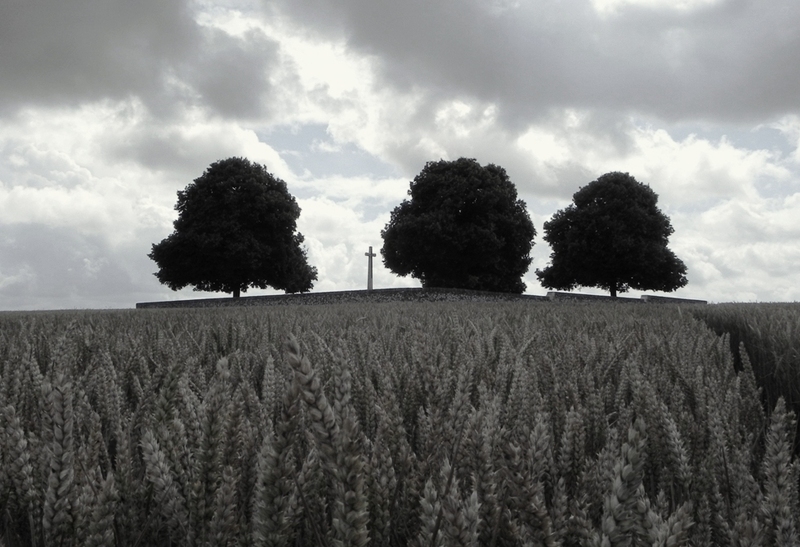 My aim was to use his story to show the importance that the fields around Arras had for not only his family but thousands of others. Peter then talked about the mass grave excavations at Fromelles and our work near Mametz (Somme) in May this year on the search for remaining pieces of a Livens Large Gallery Flame Projector. The talk was followed by a book signing and the event judged a great success. We were treated to a lovely meal out in a restaurant in the Petit Place by M. Prestaux, head of the Arras Tourist Board. My thanks to Isabelle Pilarowski and the staff at the Wellington Quarry, Alain Jacques and M. Prestaux. Lovely also to see Philippe Gorczynski there. Overall, it was a real success and an honour to find out that we were the first two English historians to speak in French to a French audience in Arras.